The airlines industry has finally gone to the dogs (and cats). Pet Airways is launching the first pets-only airline, complete with first-class travel, flight attendants,and lounge check-in areas. A fleet of 20 planes — including 747s – have no seat belts or overhead bins. “Pawsengers” will be riding in style in their own pet carriers in the planes’ climate-controlled cabins. That means no more cargo. Flights start at $149 and are available to and from New York, Washington, D.C., Chicago, Denver, and Los Angeles. Only dogs and cats are currently allowed. But the airline plans to expand to include other pets. Potty breaks for pets are provided two hours before takeoff, according to Pet Airways’ Web site. 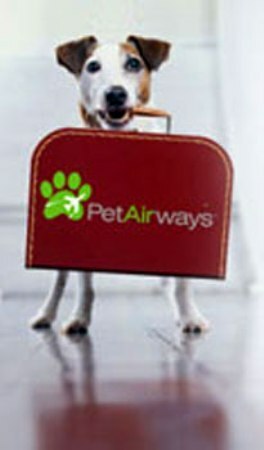 Pet Airways Web is also hiring “pet attendants” to assist during the flights. Otherwise, no humans are allowed on the planes. Dan and Alysa Binder founded Pet Airways, after becoming discouraged with traditional flying options with their Jack Russell Terrier, Zoe. The concept should make for smoother travel for pets. According to a study by the San Francisco SPCA, about 2 million pets ride in plane cargo areas each year, and about 5,000 of them are injured during the trip.